Captain Frank Edmund Getting was born in Sydney in 1899. He was in the first entry of the newly established Royal Australian Naval College at Osborne House in Geelong, Victoria in 1913. He graduated in 1917, with Waller, Collins and other Midshipmen who went on to contribute significantly to the newly formed Royal Australian Navy. 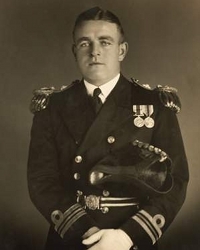 In 1926, Getting became the first Australian Submarine Officer to pass the Royal Navy’s submarine commanders’ course and, in 1928, he was appointed Commanding Officer of the submarine, HMAS Oxley (I). From 1935 to 1939, at the rank of Commander, he served as the Operations Officer to the Fleet Commander. At the outbreak of war with Germany, Acting Captain Getting was appointed in command of the armed merchant cruiser HMAS Kanimbla (I). In 1940, he was appointed Deputy Chief of Naval Staff, a post he held until 1942, when he was given command of HMAS Canberra (I). On the 14 July 1942, after extensive refit and change of personnel, HMAS Canberra (I) sailed for New Zealand to form part of Operation WATCHTOWER, the invasion of the Solomon Islands by US Marines. The Solomon Islands campaign was the first offensive action against the Japanese in World War II, and the first opposed allied landing since the Gallipoli Campaign in 1915. Early in the morning of the 9 August 1942, two days after the invasion began; superior enemy forces surprised the ships of the Allied Task Force screening the troop transports. HMAS Canberra (I), the lead ship of one battle group, in the absence of the flagship HMAS Australia (II), came under long-range torpedo fire from Japanese cruisers. HMAS Canberra (I), at action stations and ready to engage the enemy, was hit by 24 enemy shells in about two minutes fired from a range of one nautical mile. HMAS Canberra (I) suffered extensive damage and Captain Getting was severely wounded but remained at his post, refusing medical treatment. He was subsequently evacuated to an American Hospital ship but later died of his wounds and was buried at sea.